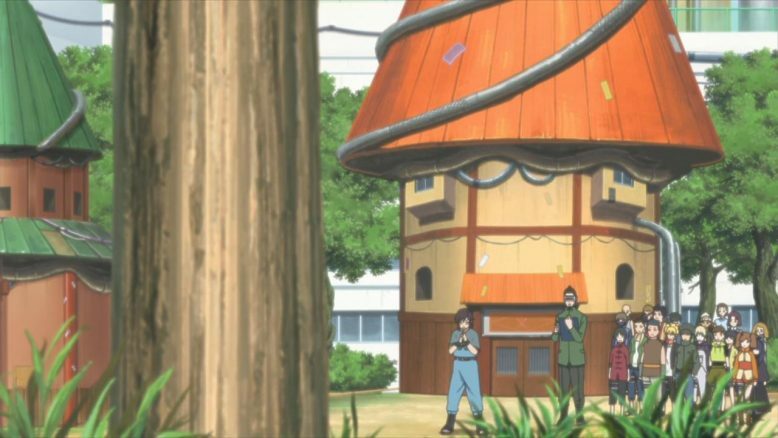 Boruto’s latest episode is another shinobi slice of life episode, but one that marks the beginnings of one heck of a bromance. 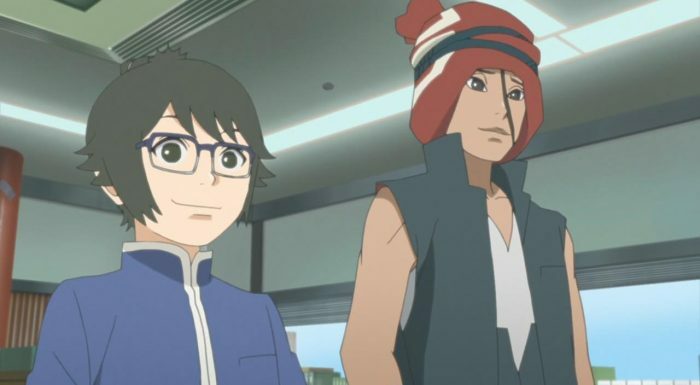 Iwabe and Denki are two characters that made their debut in this new anime series, and its in the show’s 16th episode, that the two get an episode that is primarily there’s, with Boruto himself relegated to playing more of a supporting character. As anyone following my episode blogging for a while probably knows, I’m actually generally a pretty big fan of episodes like the one we got this week. There’s definitely a feeling of filler in episodes like this one, but… Much like during some of the better filler episodes for another show (Fairy Tail), I like how this week’s episode gives us something new about certain characters that we wouldn’t see under normal circumstances. Yes Boy, Climb that Log! The big obstacle that Denki and Iwabe face this week, is something we’re all familiar with, a school exam. Unlike the ones we’re used to dealing with, however, Denki and Iwabe have a test that’s got a physical, Shinobi based part and a pretty complex, Engineering bit as well. Iwabe’s great at the physical stuff, while Denki’s good at the more technical stuff, but neither can really nail both aspects by themselves. So… This episode is more or less about the two of them coming together and helping each other out, while also developing a real bond friendship. Yes, the story here is nothing original. The brains and the brawn develop a sense of comradery and end up learning from one another, and finally surmount their big challenge. 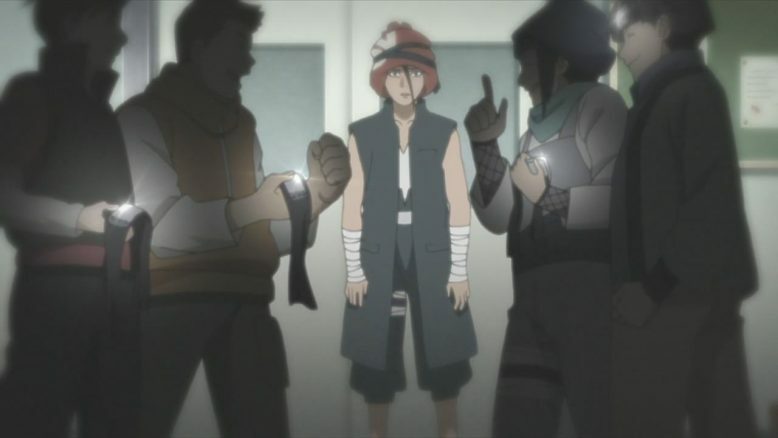 Its a story as old as time, but I think what makes Boruto’s version stand out, is the unique Shinobi angle and, more importantly, the characters its features in this little story. Both Denki and Iwabe are misfits of sorts, people who don’t really fit in, and its in the exploration of their specific positions in the class, that the show ends up making the whole episode really emotionally powerful and resonant. You really feel for both Iwabe and Denki, as both of them really struggle to succeed in situations where nearly every one of their friends is a natural. Iwabe’s story is probably the sadder of the two. As the show kind of showed us in its early episodes, Iwabe’s a guy who’s been held back a grade in the Shinobi Academy, so there’s nothing new there. What is new is the realization that Iwabe ended the way he did because he didn’t have a good teacher or supportive friends to help him in his personal struggles. Its no wonder that the kid ends up resenting everything when we first see him in the series. 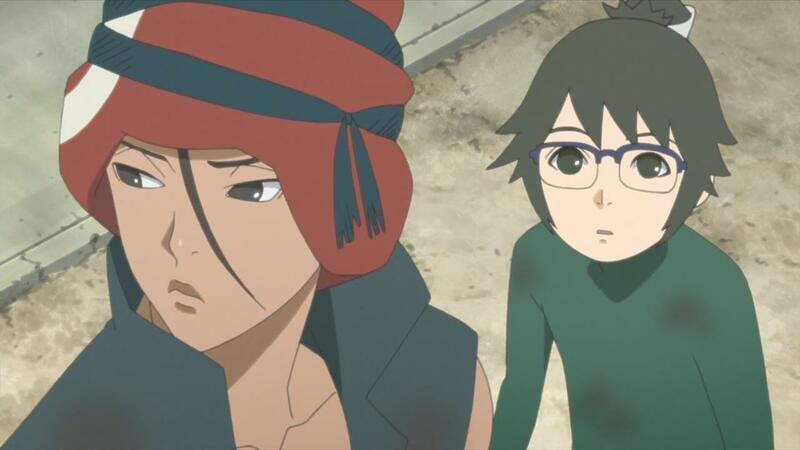 And I’m sure we all remember how Boruto was able to break through to Iwabe and bring him along as a friend. That’s all true, but as this week’s episode reveals, that particular issue isn’t over and there’s definitely some serious baggage and pain still left. Iwabe’s struggles and pain, are given some elaboration, and for the first time, we actually see everything from his perspective this week. It turns out that Iwabe’s feelings and complexes are actually very close to the ones real held-back students feel in our reality. People like Iwabe are sadly left behind because society fails to give them the environment and the help to succeed. What’s worse, of course, is that after those very kids are left behind, the system having failed them, they then have to deal with an intense sense of humiliation and isolation, as everyone passes them by. That’s some pretty heavy subject matter, and I’m actually pretty impressed with Boruto (the show) tackling it so maturely in this week’s episode. Why do I say maturely? Well because Iwabe is, at his core, a nice guy. Its Iwabe’s reactions that prevent this episode from coming off as too preachy and actually make it a feel good episode instead. Iwabe intially shrugs off Denki’s accidental insult, and then actually goes a step forward. He thinks of Denki and his fears of repeating a grade and actually decides not to ask him for help as a result. Denki, who unlike Iwabe, is actually struggling with the more practical, shinobi based “wall running” part of the test. Dude, its just walking vertically on a wall! Denki’s problem is one that many people seem to run into in reality as well; He simply tries too hard and lets the pressure get to him. The fear of failure is something that can drive even the best to miss the mark when it counts, but what makes Denki’s situation unique is how he actually isn’t from a Shinobi family. Unlike literally everyone else, stuff like Chakra control and being able to fight are not things that come naturally to the kid, and so its no surprise that he finds himself unable to relate to or even understand the suggestions that most of his friends give him. Compounding the whole issue, is of course, Denki running into both Rock and Metal Lee. The two naturally athletic, head strong guys who just power through things, are probably the least suited to help Denki out. Its worth noting of course, that this week marks the first time we actually see Rock Lee as an adult in this series, and its pretty much what you’d expect. Rock Lee is pretty much the spitting image of Guy-sensei at this point. He’s a decent guy, and has some sound advice for both his son and Denki, but really can’t relate to Denki’s particular struggles properly. 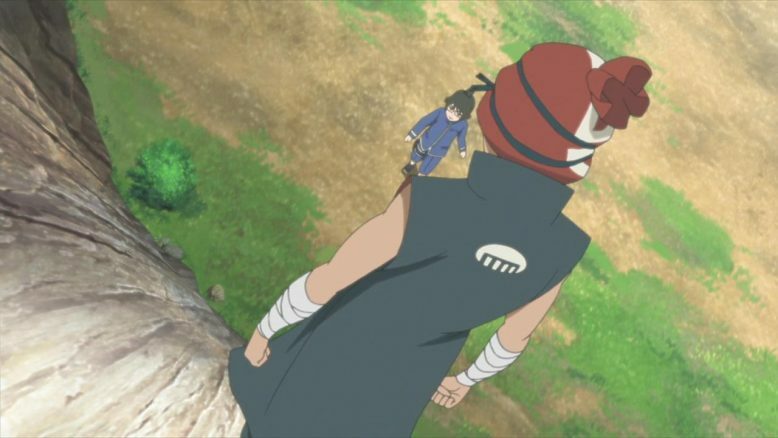 According to Iwabe-sensei, relax and stay calm and you TOO can walk up a wall! Its Iwabe instead, who ends up being the best teacher for this particular situation. He correctly analyzes that it’s Denki’s mental composure that’s the root of the problem and gives him pointers to overcome that. 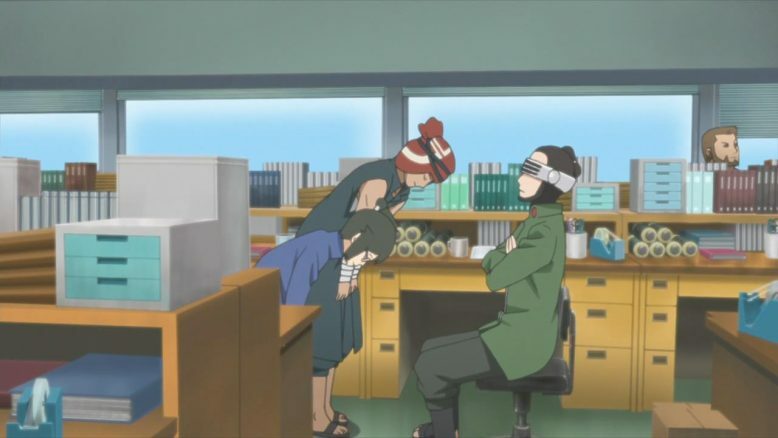 Denki in turn, obviously helps Iwabe get through his studying problems, in a rather funny way as well. I can’t say that the solutions that both present to one another are actually all that plausible, but the show had done such a good job of building up my emotional investment, that I kind of gave it a pass for its rather stupid solutions to both Denki and Iwabe’s problems. Things don’t end with Denki and Iwabe manging to prepare for the test, however, and the show takes us to the actual day of the exam. Its at this point, that the show throws the classic curve ball of the whole “someone is in need” on the day of the test. Iwabe and Denki end up prioritizing saving some kids from a burning building over getting to their test on time (and really, who wouldn’t?). There’s a nice little call back to the very things that both Denki and Iwabe have been learning up till this point, and while it is forced, it does work. What we get, in the end is a nice feel good moment, where Denki not only comes to Iwabe’s aid but proclaims that he doesn’t want to move onto the next grade without all his friends, including Iwabe himself. Oh yeah, Iwabe is totally a Tsundere! Of course, in class Boruto fashion, The two do actually end up passing the test as well, since actions rarely have concequences in this series. I’m sure if this was Naruto, Naruto would’ve been held back by the system and its technicality, but that’s just not the sort of show Boruto is, and I’ve kind of given up on it in a way too. The one big difference from earlier in the series, however, is that Shino actually acts like a legit teacher in this week’s episode. Shino not only passes his two students, but he gives a pretty decent cliche teacher speech to top it all off. All’s well that ends well, in traditional Boruto fashion. Before I go, I do want to talk about one more character in all this; Boruto himself. Boruto doesn’t have much of a role this week, but the few moments he does get, are nice character building scenes none the less. I loved how Boruto ends up bringing food for all his friends, realizing that he can’t really help either Iwabe or Denki directly, and instead opts to show his support in other ways. 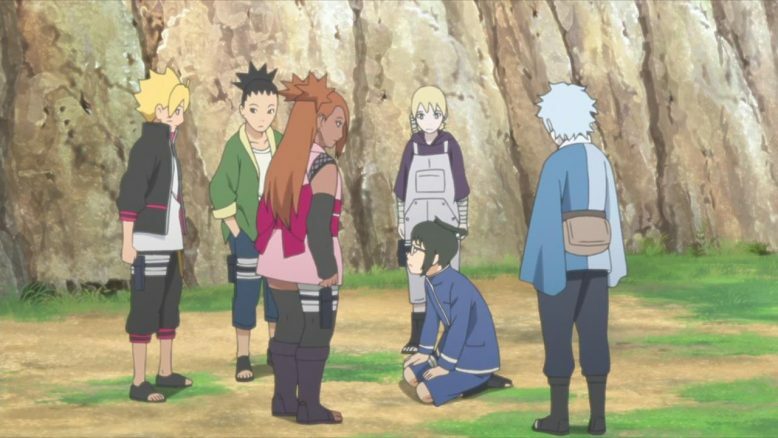 Its the sort of thing a good leader and friend would do, and its nice to Boruto continuing on that particular path that the series has him moving on. When taking as a whole, I guess I wouldn’t call this week’s episode special, but it was a nice little treat for those of us who’ve grown attached to this show’s cast of characters. There’s a nice look at Rock lee, a nice dynamic forming between Denki and Iwabe and some Boruto character development as well. The big question, of course, is about the future itself. 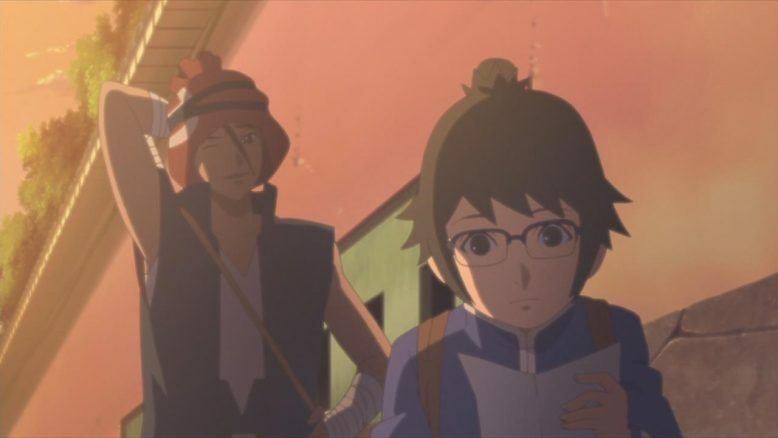 I am wondering how long the show plans to stay in the Academy days of Boruto’s life, because I really feel, more than ever, that the show needs to push forward and explore new things. I’m hoping the ED theme we’re seeing (that started last week) is an indication of something new, because if nothing else, the hints in it are pretty tantalizing.